The Chicago Police Memorial Foundation and its supporters held a special lighting and wreath-laying ceremony Thursday night at Gold Star Families Memorial and Park. 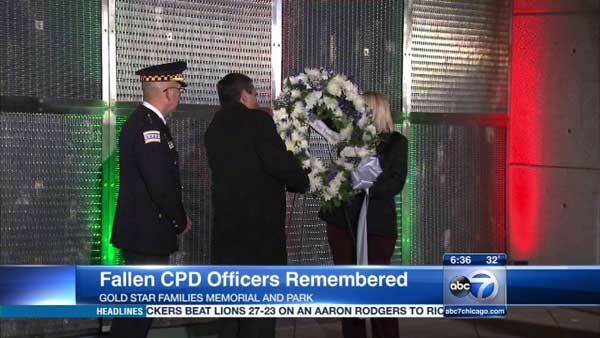 CHICAGO (WLS) -- The Chicago Police Memorial Foundation and its supporters held a special lighting and wreath-laying ceremony Thursday night at Gold Star Families Memorial and Park. It was a chance to honor and remember Chicago's fallen officers and their families this holiday season. Two young daughters of Officer Paul Nauden flipped the switch to light three Christmas trees. The trees are now glowing blue. Nauden died of a heart attack while on duty in 2011. He was on an undercover narcotics mission, the foundation said. "They want to make sure the loss they suffered wasn't in vain. It's important we remind them that their husband, wife, sister or brother was a hero," said Phil Cline, Chicago Police Memorial Foundation executive director and former CPD superintendent. The organization also supports Operation Santa, an annual tradition to provide gifts to children of fallen officers.